Now that we're getting closer to our move-in date, my nights have been filled with dreams of how to decorate my first home. Unlike all the rented apartments I've lived in, this new house will be the first place that I've had utter control over. Oh yeah, and I guess Mr. Artist gets some veto power too. 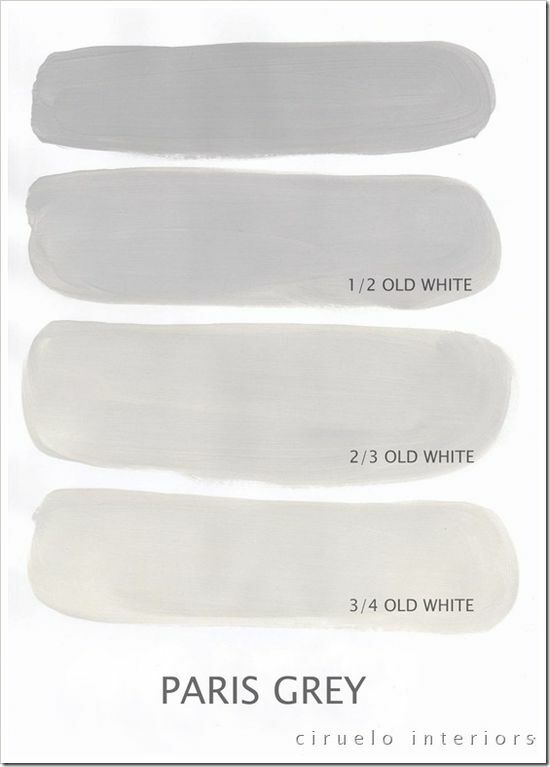 The basis, or foundation if you will, of my decor will be this palette of greys. After living in all stark white homes all my life, I've had a dream of living somewhere with more color. Unfortunately, Mr. Artist wasn't quite as onboard with the technicolor dream-coat train as me, so I opted instead for these soothing greys. I think in the end, he made the right call; grey is such a relaxing and versatile color to serve as a blank canvas for any style. I want our home to be our refuge and somewhere we can rest ourselves after the stresses of work and this palette will do just the trick. I loooove this kitchen. Absolutely looove it. The combination of robin egg, white and shiny grey countertops and steel appliances paired with the rich wood floors just all come together in a look that's modern and relaxing. Minus those horrible stools and that light fixture and this kitchen is just an airy paradise. On the other hand though, there's something about this darker kitchen that really draws my eye. 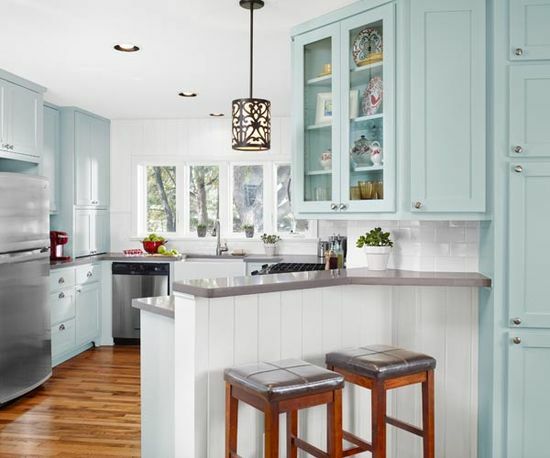 I love cozy homes with a cheery amount of clutter and this kitchen has that perfect balance of order and clutter. A home without clutter is not a home in my opinion and I want a kitchen I can wear ratty Asian-mom slippers in. 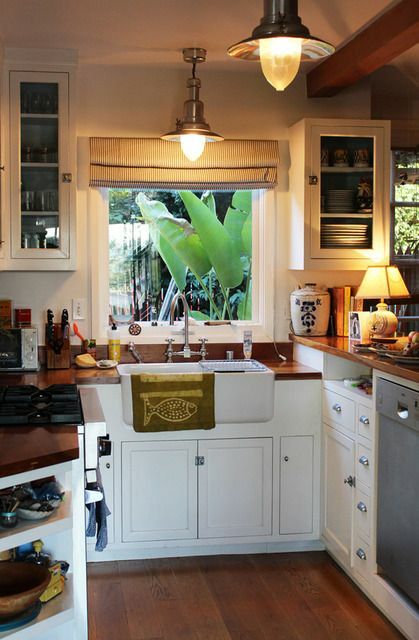 I love the deep country style double sink and the butcher-block like counters. The blinds are a nice touch as well, offering function along with no-fuss style. For the living room though, I want a mix of comfort and elegance. The living room is where you host your guests, but it also has to host your family. 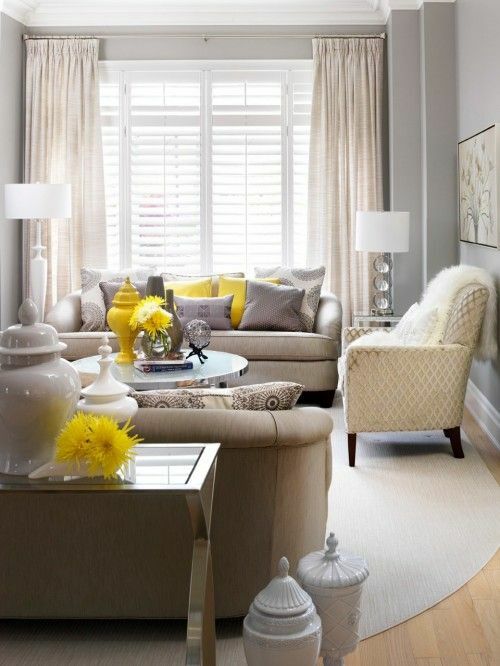 I think this living room above is almost at my ideal look with its soft grey walls and splashes of color. I'm not sure that I'd want yellow as my accent tone, but it's definitely inspiring to see how color is being used in this room. When choosing living room decor, I also always have to imagine whether our dog would fit with it. Anything with fancy embellishments or easily scratched material is a no-go. Couches and chairs have to be sturdy and rugs need to be hair resistant. Has anyone else ever had to design their furnishings around a pet? Finally, the funnest thing to shop for when it comes to home decor, are the interest pieces. Just as in a good outfit, it's the accessories that really make an outfit shine and show off your personality. 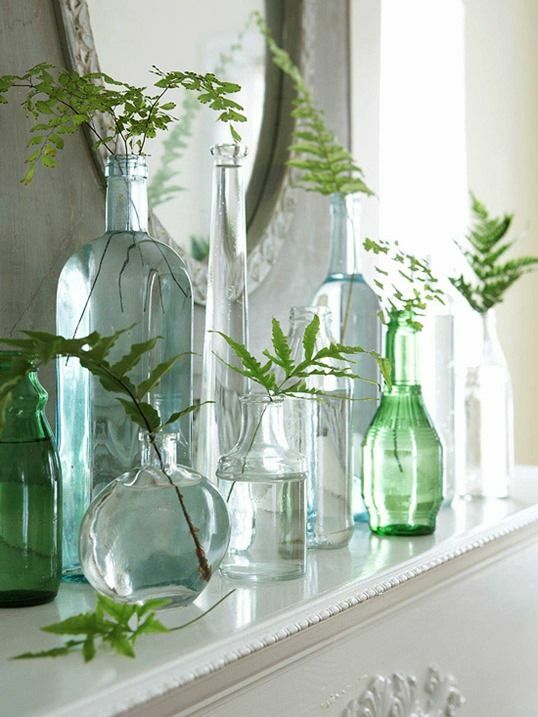 I'm really drawn lately to displays made up of similar, but different, pieces like this group of glass vases and re-purposed bottles. I love the organic feel that the glass, water and branches bring together. Just sprinkle in a couple tea lights and this look would easily look fantastic in the evening as well! I hope you've enjoyed my home inspirations! If you know of any good home decor pinners I should follow, please let me know in the comments! Poor Mr. Artist .. LoL .. how is he taking your decorating brainstorms? I remember when my wife and I bought our house ... she was so excited about furnishing and decorating it .. and she would show me all these things and send me all these links to different stuff .. it got me so overwhelmed ... so I gave her a bunch of money and let her do whatever she wanted!! =D Good luck with the decorations! When is the move in day? haha I think he's humouring me mostly. He knows I've always dreamed of decorating my own place. I think we're a good balance b/c he'll stop me from buying something that's beautiful, but utterly impractical or too trendy!